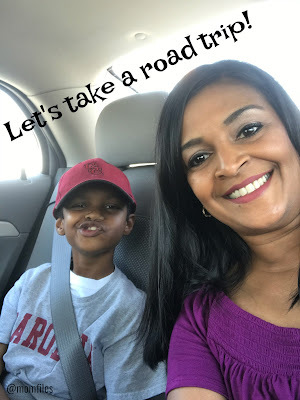 Summer break is here and many of us will be fitting in a few quick family trips before school starts back. Even if we take an overnight trip, we have learned to still pack for emergencies. You never know if something will happen unexpectedly. We have had a few scary moments during travel that really taught us a lesson. Last year we drove down to Florida to visit relatives overnight. It was the one time I told everyone to pack light. I opted to not bring any medications for our little one and of course, he ended up with a headache and fever out of nowhere. I had to send my husband to the nearest pharmacy to grab a bottle of Children's Advil® Suspension. Thankfully after about an hour, his headache and fever broke. He felt like his normal self the next day. That was definitely one of those Sick just got real.™ moments. It is imperative to be well prepared, even for a simple overnight trip. If you are hitting the road for summer travel with the kids, be sure not to forget these essentials. Snacks for the car. Go for things like crackers, nuts, fruit, granola bars, sandwiches, and portable yogurt. Medium-size cooler with ice packs and drinks. The ice packs can double to keep drinks cold and help with cooling your little one down in case of overheating or fever. Don't forget plenty of bottled water! An emergency kit to include adhesive bandages, ointment for scrapes or bug bites, thermometer (in case of fever), pain reliever and cold/cough medication such as Pfizer Pediatric products: Children's Advil®, cold/cough medications Children's Robitussin® Extended-Release 12 Hour Cough Relief, and Children’s Dimetapp® Multi-Symptom Cold Relief Dye-Free. Note: Always keep medications in the original packaging (complete with measuring cup/spoon) for accurate dosing information. Visit Sick just got real.™ for information to help with selecting the correct medications for your child's symptoms. Also, be sure to follow on Facebook for wellness tips, products updates, and promotions. This giveaway is open to U.S. Residents only and will end on June 30, 2017. Please follow all rules in the Rafflecopter widget and be sure to use a valid email. One winner will be selected and contacted via email to claim prize. Please be aware that Mom Files is not responsible for any lost, stolen or damaged prizes. Good luck! I must pack antibacterial wipes, water, and snacks. I always make sure to have Band-Aids, wipes, aspirin and Pepto-Bismol. lots of snacks, water and wipes! Also, mystery toys that can be revealed only at certain milestones during the trip and with good behavior! My essentials are wipes, snacks, water and sunscreen. I have to pack their meds after that diapers, wipes and blanket! I pack snacks, water and a first aid kit. The items I would need are water, snacks, wipes, hand sanitizer, and some bandages. My essentials for a road trip are snacks and drinks, camera, first aid kit, and activities. Lots of snacks and things for them to do! Pain reliever, wipes, snacks, and sunblock. My top essentials are snacks, drinks, hand sanitizer, sunglasses, and my cell. Essentials - wipes, snacks, drinks and good music. Lots of DVD's and snacks. 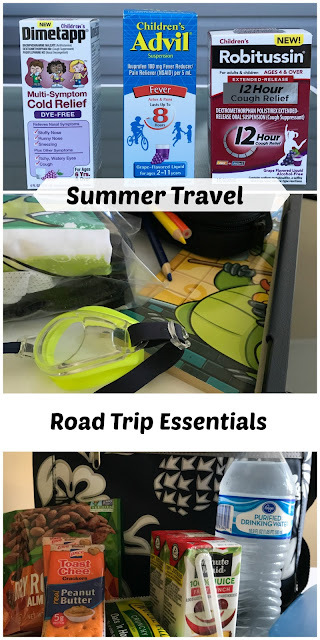 The top essentials that I pack on a road trip is snacks, water bottles, wipes and books. Water bottles, snacks, and bandaids. Snacks, games, Kleenex, baby wipes, towel and DVD Player. Kleenex, wipes, sunscreen, water, allergy and tummy meds. hand wipes, water, juice, snacks. Snacks, her favorite blanket, teddy bear, books, and a DVD player. On a road trip we pack snacks, coloring books, mp3 player, cell phone, sunglasses, water bottle and sunscreen. I pack food and games. My essentials to pack with kids are snacks, juice boxes, and DVDs to play in the portable DVD players on the back of our seats. Absolutely will need some snacks and drinks preferably water but they will sometimes ask for milk or juice. Tablets, books, and anything else that will occupy them is great. They love the music. Snacks,water and hand sanitizer sre my top three. To me, a road trip with kids requires paper towels, books, a cooler of drinks, a change of clothes, and a sense of humor. My top essentials are snacks, drinks, books and hand wipes. snacks, drinks, wipes and change of clothes. Plenty of snacks and never forget chargers for the road trip. Tissues, bandaids, wet ones, snacks, water and sunscreen. Snacks, water, games, books and wipes. Wipes, water, snacks and tablets.